It’s almost “Pi” day. What is that, you ask? In mathematics, pi is the ratio of a circle’s circumference to its diameter (and is represented by the Greek letter π, known as “pi”). The really cool thing about the ratio of a circle’s circumference to its diameter is that the result is always the same – 3.14159265358979323846… and it goes on. This number is generally shortened to 3.1415 (or 3.14). So why am I writing about Pi? Well, it’s almost “pi day.” Once a century on March 14th in the 15th year of the century (3/14/15) it is Pi day. 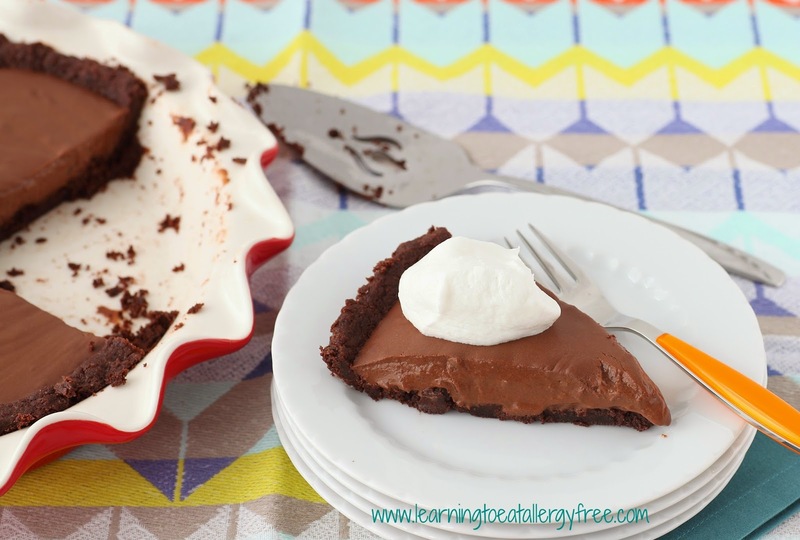 And the folks at So Delicious Dairy Free thought this the perfect day to celebrate with pie and they asked me to create a pie to help them get this party started! 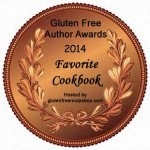 Disclosure: I was compensated by So Delicious for creating this recipe. 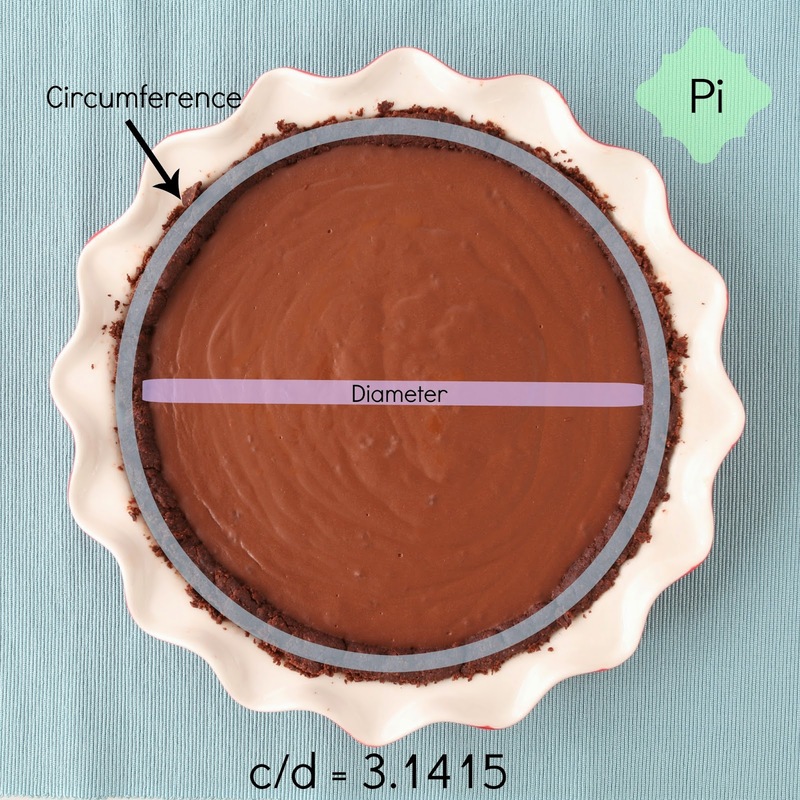 Pi = 3.1415 = c/d where c is circumference and d is the diameter (of a pie or any other circle). 3.1415 X 9 = 28.27 inches (or approximately 28 ¼ inches). Useful, right? Perhaps not, when we are waiting to take a bite of a fabulous pie made with So Delicious products!! Combine the flours, xanthan gum, cocoa powder, sugar, baking powder and salt in a large mixing bowl. Cut the shortening into the flour until crumbly. Add the vinegar and vanilla. Add up to 3 tablespoons cold water as needed, ½ tablespoon at a time, until the dough forms. Wrap and refrigerate for an hour. Preheat the oven to 350 degrees and spray a pie plate with oil. Roll the dough between 2 sheets of parchment (about ¼ inch thick) and then transfer it to the pie plate. Fix any broken pieces and form an edge with your fingers. Bake for 10-12 minutes until the cookie crust is done. Let the crust cool. Melt the shortening in a saucepan over low heat. Add the coconut milk beverage and creamer (make sure they are room temperature) and whisk together. Raise the heat to medium and bring it to a boil. As soon as the mixture starts to boil add the egg replacer mixture and whisk together for 20 seconds as it starts to thicken. Remove the saucepan from the heat and whisk in the chocolate chips (1/2 cup at a time). Whisk until completely blended. 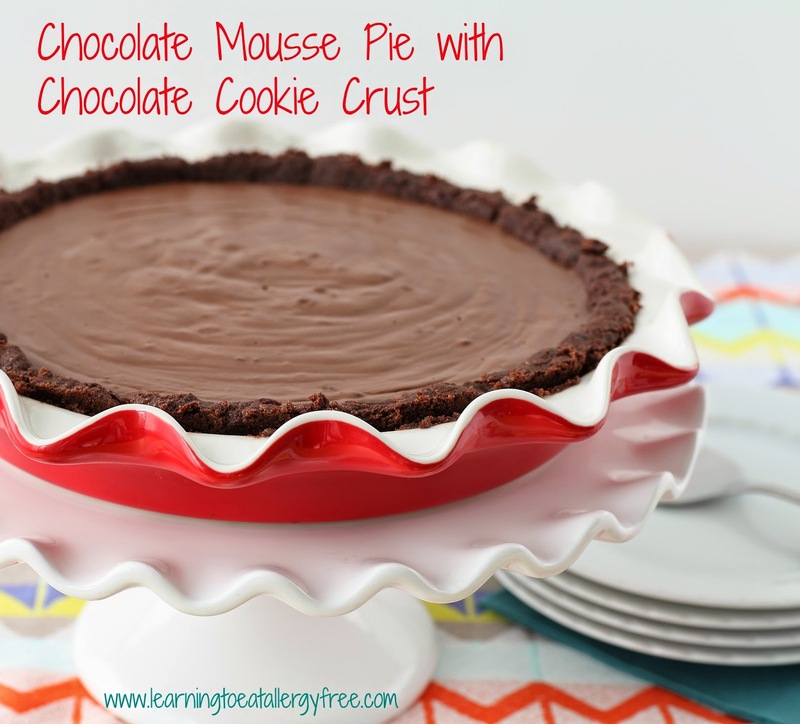 Let the mousse cool for no more than 15 minutes (don’t let a crust start to form on top of the mousse) before spooning it into the cooled pie crust. Let the filled pie cool completely (about an hour), then cover it with plastic and refrigerate for at least 8 hours prior to serving. Serve it with a dollop of So Delicious Coco-Whip! By all means go ahead and make my pie to celebrate, but you can also participate in #Pi4All for a chance to win $314 (recognize that number?) just by snapping a photo of your pie and posting it on Instagram. But there’s more – So Delicious will donate $3.14 for every photo posted to Kids with Food Allergies (a division of AAFA). 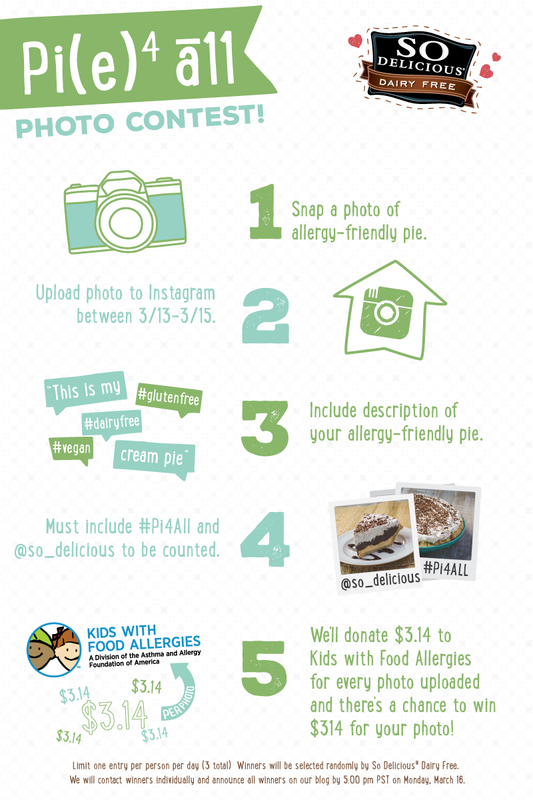 $3.14 will be donated to Kids with Food Allergies for every photo of allergen friendly pie uploaded to Instagram between 3/13-3/15 (up to $3,141.59). I can't think of a better reason to participate! Prizes: One lucky entrant will win $314 for their photo. 10 random winners will each receive 3 VIP coupons. 1. 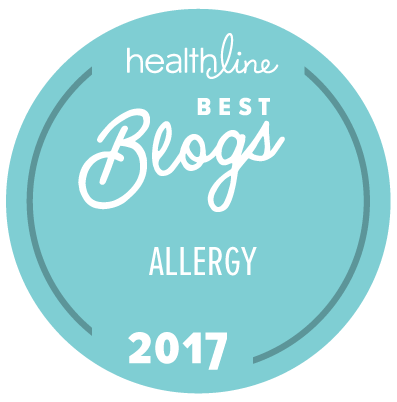 Snap a photo of allergy-friendly pie. 2. Upload the photo to Instagram between 3/13-3/15. 3. 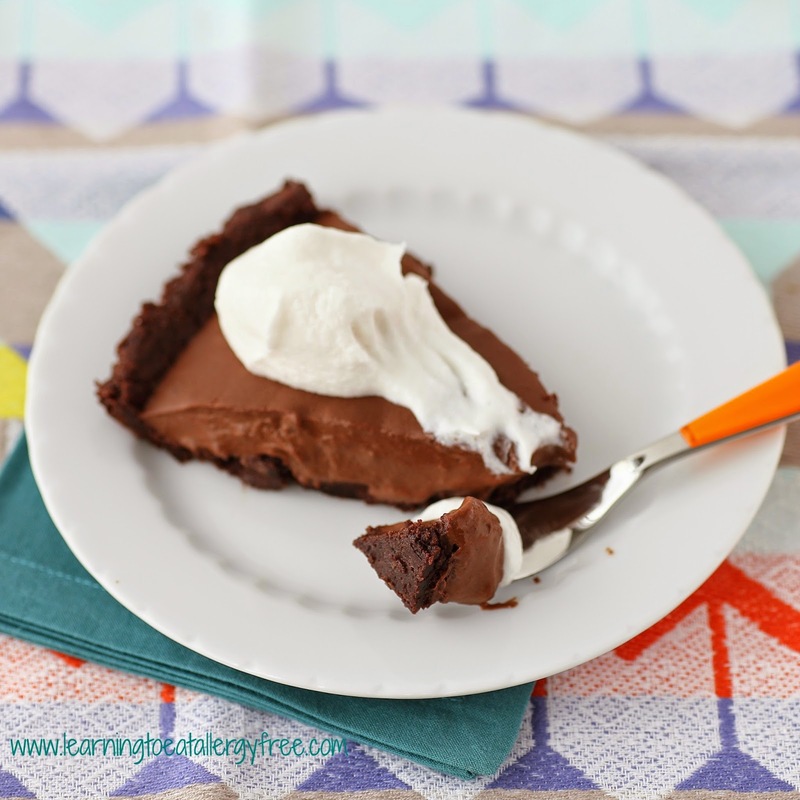 Include a description of your allergy-friendly pie (e.g., “This is my #dairyfree #glutenfree cream pie). 4. 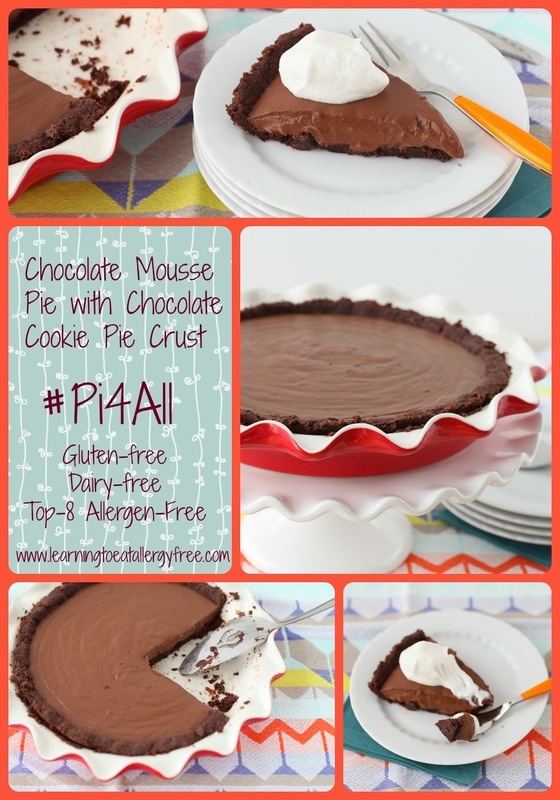 Photos must include #Pi4All and @so_delicious to be counted. 6. 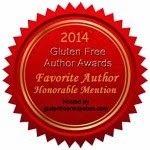 Winners will be selected randomly by So Delicious Dairy Free by 5pm PST on Monday, March 16. What a delicious looking pie! Pinned!